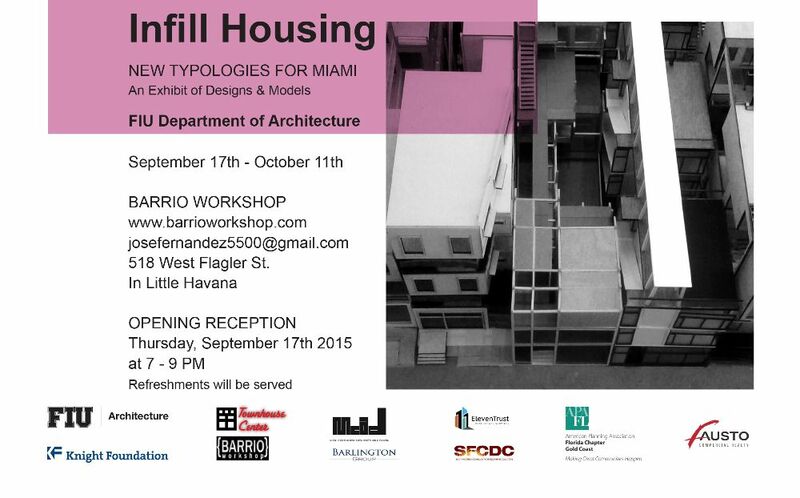 Infill Housing: New Typologies for Miami will open on Thursday, September 17th at Barrio Workshop. The exhibit is based on the Infill Housing studio provided at the FIU Department of Architecture, in which existing buildings in Savannah and Miami were used as precedence for understanding infill urbanism. Students documented entire wards in Savannah and entire city blocks in Miami to understand how the public and private realms of a city were organized. For the past several years, this studio has been devoted to the study of housing. This study continues with a new focus on urban adaptable housing typologies. The studio was divided into two parts. The first part of the studio was the documentation and analysis of existing buildings in the city of Savannah and of the neighborhoods of North Shore, Normandy Isle, and Little Havana. The second part of the studio involved the design of housing for the neighborhoods of North Shore, Normandy Isle, and Little Havana. There were six studios, and students were tasked with developing a housing prototype that could be adaptable, accessible, raised to protect from storm surge, and repeated to create new blocks. In the beginning of the studio, students and faculty visited the city of Savannah, Georgia, to understand the city’s urban plan. This year’s exhibit of Infill Housing documents the result of the students’ work. This year, it highlights more the role of precedence. Based on the idea that true innovation exists within the context of what has occurred before and that the lessons of the past inform and empower the new, this studio used Savannah as a raw material for the Miami housing proposals. A new “transformation” assignment was introduced. In this assignment, a Savannah house was distilled down to its ordering structure and then transformed to accommodate a new site. These transformations revealed the flexibly of the original structure and provided each student with parti for their own projects. Infill Housing: New Typologies for Miami opens with a reception on Thursday, September 17th, 2015 at 7PM at Barrio Workshop: 518 W Flagler Street, Miami, FL 33130. The exhibit will run until Sunday, October 11th, 2015.